Sound quality on original releases versus re-releases. There are many questions on this forum regarding sound quality. Someone asks which version of a specific album has the best sound. It seems as many answers prefer the original first pressning of a certain album. One example: If someone asks for the best sounding version of the early Rolling Stones LPs you may get the answer ”the original first Great Britain pressning on the Decca label”. But I sometimes wonder if you should trust this kind of answers! Especially when we are discussing older recordings (made in the 1960s). After the artists originally made the recording, did they have control of the manufacturing process? Did they just deliever the master recordings to the record company and let them do the rest? In the early 60s the mastring engineers were probably very good at master classical music, but what about rock music? Many recordings have been re-released several times in different formats. Why should not these releases sound better than the original first pressnings if the original master recordings still are in good shape and the re-mastering engineers do have good equipement and good ears? Finally, isn’t what makes a good sounding recording/record sometimes something different persons can have different opinions about? Bob M., gabbleratchet7, RiRiIII and 6 others like this. After the artists originally made the recording, did they have control of the manufaturing process? Did they just deliever the master recordings to the record company and let them do the rest? Finally, isn’t what makes a good sounding recording/record is sometimes something different persons can have different opinions about? Good questions, Christer. I often find tracking down the best sounding version of a record a difficult task, especially when reissues don't designate the source (i.e. digital vs analog). Yes, that is exactly what happened. Why would the artist really care about the pressing of their records? They just assumed they would be well taken care of. In the early 60s the mastering engineers were probably very good at master classical music, but what about rock music? Many recordings have been re-released several times in different formats. Why should not these releases sound better than the original first pressings if the original master recordings still are in good shape and the re-mastering engineers do have good equipement and good ears? Of course. That's why the SH Forums exist, to compare the different versions of our favorite music and try and find the best sounding version. It's fun and also bats**t crazy. Anyone else have comments on old vs. new pressings? Chime in, please. fitzrik, ibekeen, EddieT and 38 others like this. Someone correct me if I am wrong. Using RCA as an example. They number their stampers 1S, 2S, 3S, etc. Some people contend that a 1S stamper is THE first pressing. Well, I read they make several stampers to accommodate the large demand for a release. So, it is merely ONE of the stampers used with the first pressing. And besides that, back in the day RCA had two facilities, one in Hollywood and the other in Rockaway, NJ. These two plants would simultaneously make records of the same release. So they obviously could not use the same stamper. So, it could be that several stampers would used to manufacture the "first issue". And, some collectors find that certain releases have certain stampers that are preferred. The RCA Living Stereo classical records have such a following that there can be consensus as to which stamper is the best sounding, and they demand more on the market. And it is sometimes 1S and sometimes not. But a stamper wears out, so, if you get the tail end of its usable life, you may not end up with the "best" sounding LP of that release. sparkmeister, angelo73, OldSoul and 4 others like this. The sound quality of originals sounds best on certain gear. The sound quality of new remastered lps sounds best on certain gear. violetvinyl, angelo73, Tommyboy and 1 other person like this. I find the better the system, the better the originals sound. And the better the system the worse the bad ones sound. WillieDaPimp, marcb, Scotbot and 13 others like this. RCA, back in the time, had three plants. They had the main plant in Indiana. Or we should say four, if the Canadian plant is included. TLMusic, angelo73, vanhooserd and 3 others like this. Originals sound fantastic on my vintage gear as well. After all, they were designed to sound good on the equipment that was for sale at that time. aoxomoxoa, ParloFax, Jimijam and 11 others like this. I find with many run of the mill re-issues/masters, a lack of soundstage- air and depth. Unfortunately the many I've encountered have used the latest dynamically abused (digital) remasters as the source. A good test is with the old cut out bin galore A-ha-Scoundrel Days (US), 86 compared to the 2015. One standard I'd love to recommend is the latest OMD-Organisation, but Miles or someone at Abbey Road screwed it up. It and another (OMD) title have a severe channel imbalance. Shame. I'm pretty much done with em as I'm not the target market. RCA is the reason that I had to stop collecting! In the 1990s I wanted all the good RCA-Victor LIVING STEREO albums. The "Shaded Dogs" were my new passion. Well, when I found the "RCA BIBLE" book by J. V., I was shocked to learn that sometimes a 7s killed the 1s or the 5s or the 8s. It was totally operator influenced. However the cutting engineer did it meant the difference between wonder and blah..
My buddy TOM PORT of BETTER RECORDS had a giant collection of LIVING STEREOS from 1958-63, many dupes, and I spent weeks going through them. I couldn't believe the difference in one cut over another, probably done within a year or less. Some were closed in and distorted. The same album, with a different cutter number (usually higher but not always) was amazing, dynamic, open and breathtaking. It was depressing how one album could sound bad or good depending on the cut. So, not only did I have to find a clean 1959 RCA Living Stereo Shaded Dog pressing (hard anyway) but it had to be THE RIGHT CUTTING NUMBER! This ruined my collecting life and even though I got most of them clean AND with the magic cutting number, I quit soon after. Couldn't believe the variations in sound quality within just a year or two of production. I had to give it up after that. Too much. Interestingly, my collection of LONDON BLUEBACK classicals (Decca UK cuttings) were all very constant, regardless of if it was a 1958 cutting or a 1964 cutting. That was much easier for me and all collectors to deal with. Columbia USA as well, very constant. RCA-Victor, no way. Old Rusty, aoxomoxoa, ParloFax and 30 others like this. Yeah. It is far worse than trying to find the right issue of a CD. I used to do this comparison with Elvis' Living Stereo LPs. You haven't heard "Fever" until you come across the right stamper (which I no longer recall which one it was). Old Rusty and angelo73 like this. I’ve found in certain cases that I prefer something in between, call them “original reissues.” Stuff from the 60s reissued in the late 70s or early 80s in UK/Europe where it’s still all-analog mastering and the tapes were still relatively fresh, but the vinyl quality not to mention the cutting lathe was often better than it was in the 50s or 60s. There are some amazing remastering engineers working today, but often those tapes just aren’t in great shape, or they’re damaged or lost so they have to use a later generation. Mugrug12, Stone Turntable, angelo73 and 1 other person like this. I think it's 12s or something. Madness. I have an original ELVIS IS BACK LP or two. I refuse to even look at the leadout numbers. Refuse. And don't get me started on if side one is a 4s and side two is a 10s. All labels are guilty of this. Drives us collectors bonkers. My original DECCA USA Tommy that I bought when it came out had all mismatched side cutting numbers. Couldn't hear it back then but now it's obvious that the later cuttings sounded much better; different gear, operator, I guess..
ParloFax, angelo73, Former Lee Warmer and 2 others like this. I think it's 12s or something. Madness. I have an original or two. I refuse to even look at the leadout number. Refuse. Yeah, sounds like your experience was a form of aversion therapy, hunting down stamper codes. Yes, the bane of record collectors. I can laugh about it now, barely. ParloFax, Aftermath, angelo73 and 1 other person like this. Well now we have the SACDs of a lot of that Living Stereo classical material (going out of print though) and then we have the 3 HUGE CD box sets of the same. Yes Steve, that's exactly what I meant. Originals were cut for the gear of the day. Just as you've mentioned over the years when RVG cut the mids so hot to wake up those console stereo systems of the day. angelo73 and Tommyboy like this. As far as I’m concerned, I know the only case where 1S is preferred with LIVING STEREO. It’s Reiner’s Roma. But it has another story. Exactly. Doesn't translate that well to our modern super systems now, but it's still fun (if expensive) to own a good condition original pressing of our favorite music. Love to watch those labels going around, I never put a record weight on them. Shak Cohen, Aftermath, angelo73 and 3 others like this. Yes, but the real magic of that music comes through the best in an original, properly cut RCA Living Stereo Shaded Dog. It's the magic of the Westrex/Scully cutting system. Cannot imitate that 3-D sound easily..
ParloFax, Aftermath, Stone Turntable and 2 others like this. john lennonist, angelo73 and Leviethan like this. I always prefer my digital recordings to more closely resemble the master tape. That way, I can make my own adjustments if necessary, but that rarely happens. I have noticed a trend for newer hi-rez recordings i've heard to have a more natural sound. I hate it when a mastering engineer tries to bring vocals way out front and center. In another thread, I mentioned how I like the recent hi-rez of Foreigner's "Double Vision album", but I didn't say how it now sounds like Lou Gramm's yelling in my ear. Oh yeah. I remember what I really wanted to say: A lot of early 80s Capitol vinyl reissues of assorted 60s and 70s albums may sound better than the originals. Problem is, they also often removed a track or two. Speaking about quality. Can't compare the original "Jean Michel Jarre - Equinoxe" 1978, Polydor pressing, mastered at Sterling Sound with the 2015 remastered reissue, remastered by ??? and pressed by a wellknown Eastern Europe bad pressing company. Side B (135334E2/C on dead wax) is horrible! Absolute garbage. Besides, these new mastering engineers brickwalled the master tapes at 20 KHz. Everything above the 20KHz is my vinyl restoration work. 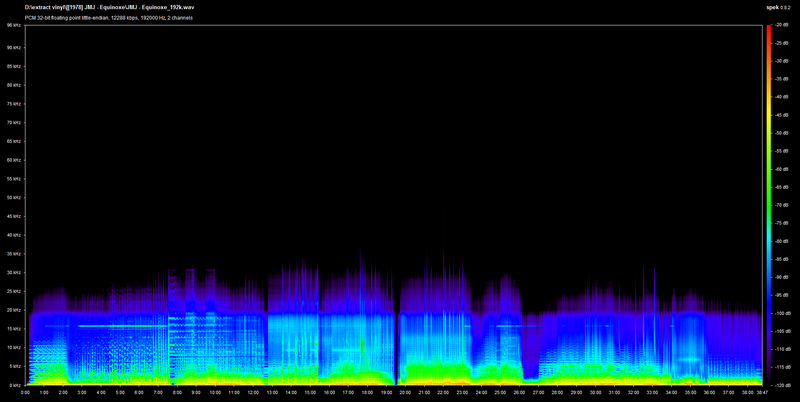 And the Dynamic Range is low, only 12, likely they pressed the vinyl from whatever CD. My needledrops usually have 13-15 Dynamic Range and the vinyl sounds go up to 40-45 KHz. There are way too many factors, including the quality of the vinyl used. For example, Modern Harmonic's reissue of Tak Shindo's Mganga! will sound much better an original on Edison International.